Inky's flexible interface offers three different layouts as well as other interface tweaks. It's been nearly a year since I first looked at Inky, the desktop email client that aggregates all your email accounts and strives to highlight your most important messages. At the time, Inky was still half-baked but showing great potential. Since then, Inky's developers have tweaked its interface, fixed some bugs, and added some exciting new features. Inky is easy to set up. As I'd already done this with the older version, my accounts loaded automatically as soon as I installed the new one. This saved me the hassle of setting up, but also caused some problems, as you will soon see. 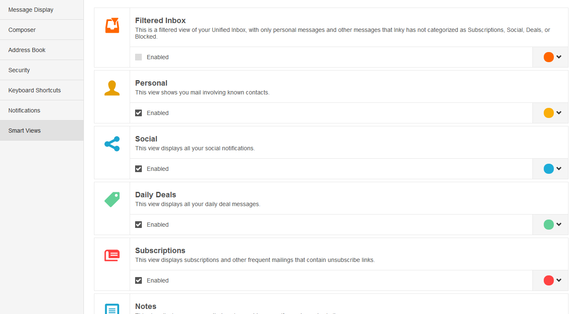 Pick and choose between Inky's smart inboxes for as much automatic sorting as you need. If it's your first time with Inky, entering your email address and password should prompt Inky to detect the right settings for most email providers. You can also enter your settings manually. Moreover, you can now choose an icon and color for each of your accounts for easy visual differentiation. Inky still uses smart inboxes to help you filter your mail and attempts to file your emails into these categories automatically. It will also try to determine which emails are more relevant to you. This algorithm is pretty accurate right out of the box, but you can educate it to be more accurate by adjusting its importance ratings. Many bugs that I mentioned in my last review, such as the missing sender name and the inaccurate unread-email counts, have been fixed, as well as some problems which were slowing the client down. In reality, Inky still feels a bit sluggish at times, especially with certain operations, and while CPU and RAM usage were way down at first, Inky does start hogging RAM a bit after being on for a while. 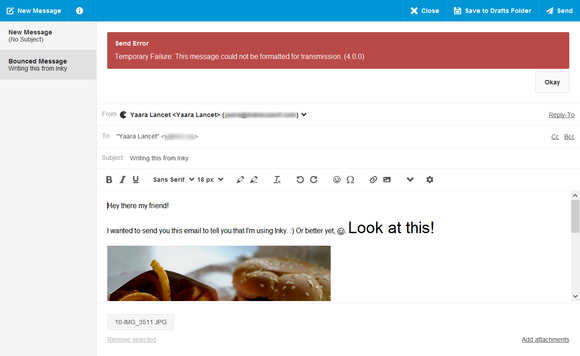 Another significant problem I ran into was an inability to send emails. The cause turned out to be settings that were automatically migrated from the previous version of Inky, so if you've never used Inky before, it's nothing to worry about. It was frustrating, however, and were it not for Inky's efficient tech support, I might have given up on the whole thing. Inky's composer features all the usual formatting options and a multilingual spell checker, but RTL support is still problematic. If you're using multiple accounts, it's easy to choose a different sender address for each email, and the entire composing experience, including the efficient auto-complete for contacts, is on par with Gmail's, if not better. Drafts are not saved automatically, though, which might confuse many Gmail users at first. The composer is intuitive and fun to use, with multiple ways to add attachments. Some of the nicer new features include an unsubscribe button where appropriate, which either sends an email in your name or lets you unsubscribe on the Web. 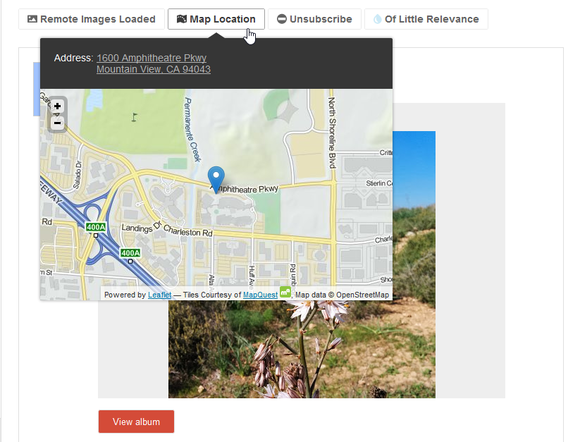 Emails featuring physical addresses also include a map button, letting you see the exact location on a small map. The killer feature is the as-you-type search, which instantly finds anything in your emails and easily deals with even huge databases. By using hashtags, you can search only within certain categories such as deals, social, or personal. Inky detects any physical address and displays a convenient map accordingly. On paper, Inky has everything: it's flexible, powerful, includes every feature I could think of, and has a slick interface to boot. It's also under constant development, which is always assuring when dealing with something as important as an email client. At the moment, however, it's still not snappy and responsive enough to entice me to switch. For more advanced users, it might also be missing some power features. Hopefully, with bit more time Inky will fulfill its promise to deliver the next step in email evolution. 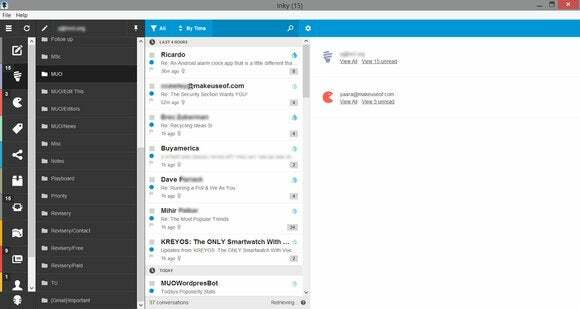 Though it's still working out some kinks, there's plenty to love about this strong email client.